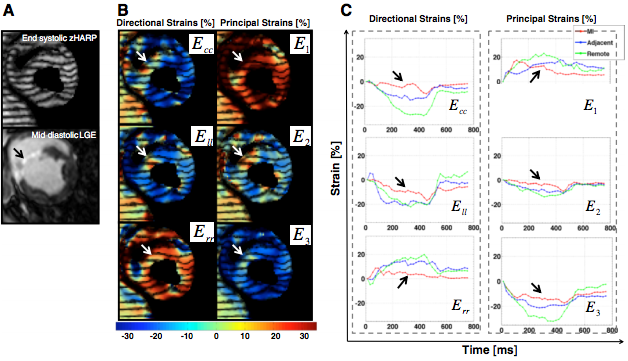 Difference between revisions of "Three-dimensional regional strain analysis in myocardial infarction"
3D strain analysis is tested against 1D and 2D strain analysis on pig hearts to determine which has a better diagnostic accuracy. |'''Figure 1''': Example LGE images in nine animals. Myocardial infarction is mainly located in the anterior wall and anterior septum with transmurality greater than 90% of the wall thickness (yellow arrows). Isolated infarct zones, and slices with sub-endocardial infarct and no presence of transmural infarct were not observed in the entire dataset. |'''Figure 2''': This figure illustrates epicardial and endocardial borders and the transmural infarct border points on an example LGE and five zHarp images as selected cardiac phases. (A) Epicardial and endocardial borders (blue contours) and borders of transmural MI (red points) are delineated on the LGE image. Myocardial tissue enclosed between MI points is called the infarct segment. The rest of the myocardium is divided into equal segments. Infarct segment 1; Adjacent: segment 2, and 6; Remote: segment 3, 4, and 5. (B) Landmarks delineated on the LGE image are mapped and located on all zHarp cardiac phases by Harp tracking and myocardium is divided into segments accordingly. Five cardiac phases are selected for demonstration. |'''Figure 3''': Figure A shows an example of an end-systolic zHARP image and its corresponding mid-diastolic LGE image in one animal at early post-MI. Directional and principal strains overlaid on the zHARP image and their temporal profile are shown in Figure B and C, respectively. Reduced magnitudes were observed in all strain indices in infarct segments versus adjacent and remote segments (Figure C, black arrows). Out of the twenty animals, five died due to incessant ventricular fibrillation. Surviving animals all completed the imaging protocol. 3D strain differed significantly in infarct, adjacent, and remote segments (p &lt; 0.05) at early and late post-MI. In univariate, bivariate, and multivariate analyses, circumferential, longitudinal, and radial strains were significant factors (p &lt; 0.001) in differentiation of infarct and adjacent segments from baseline values. In identification of adjacent segments, receiver operating characteristic analysis using the 3D strain multivariate model demonstrated a significant improvement (p &lt; 0.01) in overall diagnostic accuracy. Overall, 3D strain analysis showed a 96% diagnostic accuracy with 2D strain analysis showing an 81% diagnostic accuracy with 1D strain analysis left at 71% diagnostic accuracy. Figure 1: Example LGE images in nine animals. Myocardial infarction is mainly located in the anterior wall and anterior septum with transmurality greater than 90% of the wall thickness (yellow arrows). Isolated infarct zones, and slices with sub-endocardial infarct and no presence of transmural infarct were not observed in the entire dataset. 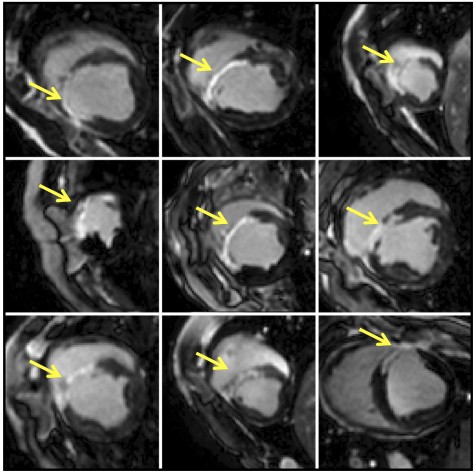 Figure 2: This figure illustrates epicardial and endocardial borders and the transmural infarct border points on an example LGE and five zHarp images as selected cardiac phases. (A) Epicardial and endocardial borders (blue contours) and borders of transmural MI (red points) are delineated on the LGE image. Myocardial tissue enclosed between MI points is called the infarct segment. The rest of the myocardium is divided into equal segments. Infarct segment 1; Adjacent: segment 2, and 6; Remote: segment 3, 4, and 5. (B) Landmarks delineated on the LGE image are mapped and located on all zHarp cardiac phases by Harp tracking and myocardium is divided into segments accordingly. Five cardiac phases are selected for demonstration. Figure 3: Figure A shows an example of an end-systolic zHARP image and its corresponding mid-diastolic LGE image in one animal at early post-MI. Directional and principal strains overlaid on the zHARP image and their temporal profile are shown in Figure B and C, respectively. Reduced magnitudes were observed in all strain indices in infarct segments versus adjacent and remote segments (Figure C, black arrows). This page was last modified on 25 August 2016, at 10:00.